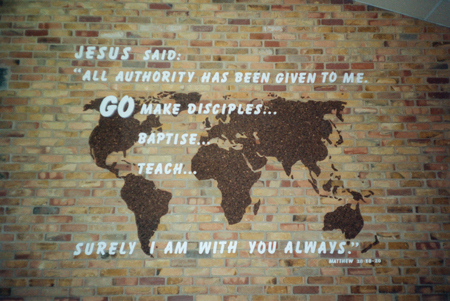 This wall map nearly 3m (10 ft wide) was made by the Pastures Church Banner Group to help the church focus its vision for praying for the whole world. A précis of the Great Commission from the end of Matthew’s Gospel was cut from 2 cm (4/5 in.) thick polystyrene using a hot wire cutter. It was overlaid on a world map cut from cork tiles mounted on almost invisible net. The map was fastened to a plain brick wall at one side of the church by a lot of Blu-tak and the minimum number of small wall tacks so that it can be eventually removed with no damage to the wall. Once in position the net was carefully cut away, just leaving a little for strength around the small islands to keep them in place. We believe that the message was an inspiration for the church’s worship during the year that it hung in place.